Aaron Burr was many things: a colonel in the Revolutionary War; Jefferson’s Vice President; a fugitive from the law; a defendant on trial for treason for allegedly attempting to found his own country; and the killer of Alexander Hamilton in a pistol duel. (Even those who don’t remember him from grade school might recall the classic “Got Milk?” ad, which, incidentally, was directed by Michael Bay and won him a Grand Prix Clio award.) 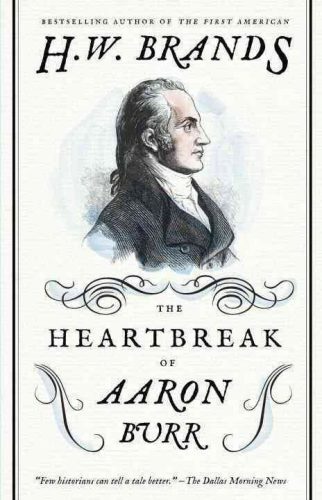 For both better and for worse The Heartbreak of Aaron Burr, written by acclaimed historian H. W. Brands, focuses on the correspondence between Burr and his daughter. This strategy succeeds in showcasing the genuinely interesting relationship between these two intelligent and appealing early American figures. But it at the same time shortchanges the exposition on some of the major events of Burr’s otherwise tumultuous life. Less than two hundred pages cover to cover, Heartbreak lays out the details of Burr’s lifetime in short, swiftly moving chapters. After the war, Burr becomes a distinguished lawyer before beginning a career in politics which included time as a Senator for the state of New York, and the Vice President for Jefferson’s Democratic Republican party. His life from there is a run of misadventures, from that infamous duel, to a failed campaign for governor, to conspiracies and militia-building activities in the Western states that lead him to be tried for treason. Perhaps the one constant through it all is that Burr and his daughter, Theodosia, remain close companions and confidants. The central drawback of the book, however, is that it purports to be not only an exploration of this father-daughter relationship, but also a general biography. And these aims at times work at cross purposes. Brands sometimes hustles through parts of Burr’s life in which Theodosia is not a central player or interlocutor. The writing always remains crisp, but the actual major events of Burr’s life—many of which are exciting and consequential—are often presented in an almost workmanlike fashion. In addition, the focus on the relationship between Theodosia and her father provides a skewed impression of Burr, one at times jarringly different from the man we see committing the actions he does. This is the case, for example, when Burr writes to Theodosia’s husband that, “I have called out General Hamilton, and we meet tomorrow morning.” (57) It should of course be no surprise to the reader that Hamilton and Burr hold a formal duel, and that Hamilton is ultimately killed. In fact, part of the fun of reading a book like this is the anticipation of such landmark events in American history. (It’s like a Roadrunner cartoon or the Titanic movie in that the tension lies not in discovering what happens, since the audience knows generally what’s coming, but in seeing exactly how it all plays out.) So it comes as no revelation that Burr challenges Hamilton, that each boats out to a meeting place in Weehawkin, and that the former Secretary of the Treasury is mortally wounded by the sitting Vice President. But at the same time, while reading Heartbreak, this all strikes the reader as out of character for Burr. Was Burr really so honor-bound, or perhaps petty and revenge-fueled, that after not receiving the proper apologies from Hamilton about nasty things said during a political campaign he would resort to a lethal duel? (At that time, while dueling was still not entirely uncommon, it was strictly against the law in New York, hence the trip to New Jersey where—while also outlawed—the crime was less consistently prosecuted.) It can be inferred from the events of Heartbreak that he was. But this runs against the characterization of Burr that has emerged in the book thus far. It is equally surprising to see Burr engender in his contemporaries such astounding levels of animosity. Through the letters to his daughter that provide the foundation of Heartbreak, Burr comes across as reasonable and attentive, if also less than responsible with this money. We also get that Burr is strongly ambitious, image conscious, and a very smooth talker. But this goes nowhere toward preparing the reader for the extraordinary hostility he inspires in figures like Hamilton and Jefferson. Hamilton appears to detest Burr so much that he actively works to have his enemy Jefferson elected over Burr for President when the two tie in electoral votes. Jefferson appears to revile Burr so deeply that he avidly pursues the charge of treason (punishable, of course, by death) for his adventures in the Western states, even when the case rests on flimsy grounds. In the last of Burr’s escapades in Heartbreak, we find him destitute, exiled from the US, deported from England, and washed up in France with no way to get a passport to leave the country. By this point in his life Burr has finally given up on his dreams of fame and distinction, and the solitary goal of his existence is to find his way back to the US so that he can spend time with his daughter and grandson. The entire book thus far, it turns out, has in part been a preparation for understanding this last journey. And it is well worth the read to see exactly how it all plays out. Posted in Book Reviews and tagged Aaron Burr, Biographies, history. Bookmark the permalink. Trackbacks are closed, but you can post a comment.